People who like outdoor sports all want to own a smoothly hunting knife. CIMA-1, which is made of 7CR17MOV steel. It is a whole Tang outdoor hunting knife. It should have 0.5 pounds or so, this kind of flax textured micarta handles, non-slip, wear-resistant. Six six-star screw firmly to the blade and the handle fixed together, feel is very good.Here is its number, each knife number is unique. Like this is a CIMA-1 No. 3782 knife.Here CIMA KNIVES 7CR17MOV, 7CR17MOV is this knife steel model. The hardness can be reached 58-60HRC after quenching. The features of stell are many, hard, toughness, to prevent rust and so on. 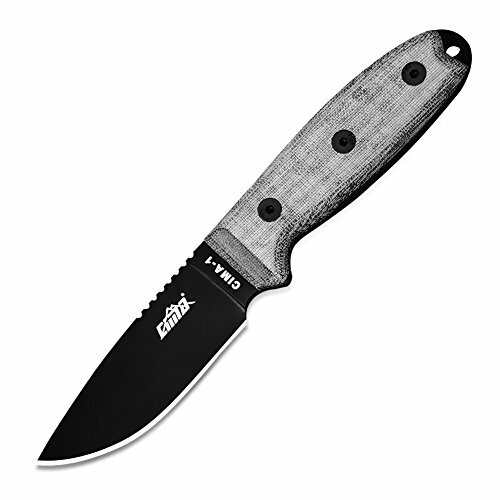 Full-Tang hunting knife is durable, not easy to damage, and CIMA-1's blade is very thick. The gear is non-slip , can also be used to friction magnesium rods flint. Look CIMA-1 blade, own the perfect blade process and very sharp.Knife's tail has a tactical hole, you can wear a rope made of rejection knife, easy to cut off the high branches . Let us look at the CIMA-1 scabbard, which is a ABS sheath, is very convenient and beautiful. It also can protect the knife and easy to be carried.In addition, the gift box packaging texture is very good . Length 8.46 "blade length of 3.34" Thickness 0.177 "
If you have any questions about this product by CIMA, contact us by completing and submitting the form below. If you are looking for a specif part number, please include it with your message.